It is stressed that this report has a different focus from other recent reviews (IPCC, 20007b; Stern, 2006): it concentrates on the European scale and investigates methodological aspects in detail. EEA Technical report No 13/2007. ISSN 1725 2237. ISBN 978-92-9167-974-4 EEA, Copenhagen, 2007. EEA Technical report No 13/2007. ISSN 1725-2237. ISBN 978-92-9167-974-4 EEA, Copenhagen, 2007. 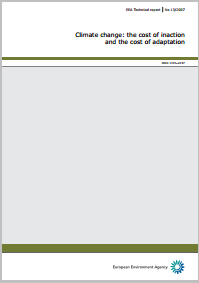 For more information on monitoring the effectiveness of climate change adaptation measures, another paper called 'Making Adaptation Count' provides a detailed analysis of different techniques of monitoring and evaluating.